As I look back on this year and the time that has passed since my book came out, I can’t believe some of the events that I have been a part of during my marketing campaign. I’ve participated in several book sales and signings and given two presentations. For someone who is a very nervous public speaker, that’s a big deal! This fall, I wrapped up my year of marketing with two events centered around the Diamond: a slide presentation at the Ligonier Valley Library and a holiday book signing at the Ligonier Sweet Shop during Black Friday weekend. On Tuesday, October 29, I had the pleasure to give a presentation at the Ligonier Valley Library based on Ligonier Valley Vignettes: Tales from the Laurel Highlands. As I summarized each section of my book and worked my way chronologically thorough the history of the Ligonier Valley, I displayed some slides containing images from my book. Afterwards, I met with some of the wonderful people who came out to hear my talk. I also talked about the history of the Ligonier Valley Library and how a late-nineteenth century library presence eventually evolved into a community institution that’s connected to a county-wide system of libraries. The Ligonier Valley Library is very near and dear to my heart, as they have not only supported my research efforts for the past ten years, but I’ve made some wonderful friends there, most notably Pennsylvania Room Archivist Shirley Iscrupe, who I’ve talked about before. I can’t thank the Pennsylvania Room enough for its support. It’s been my haven for many years. My book is intricately tied to the library, as many of the images contained in it are from the Pennsylvania Room’s collection. 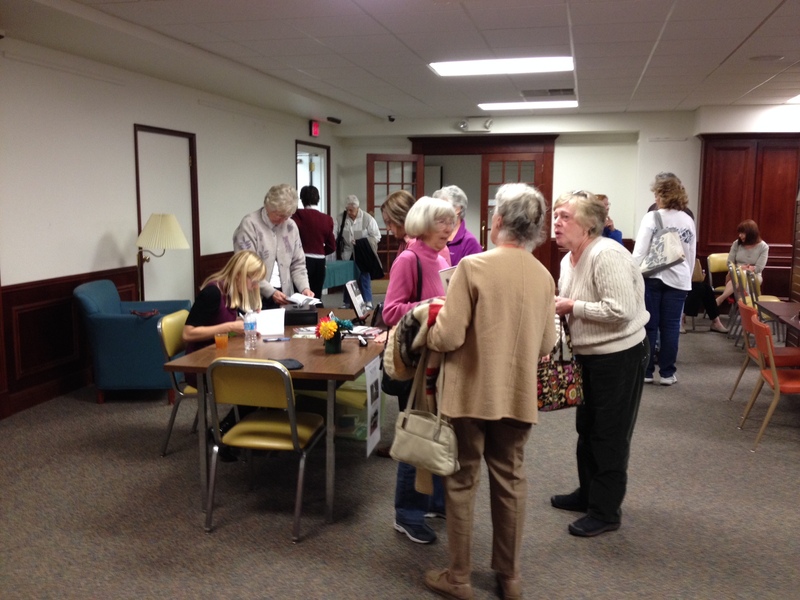 One of the vignettes I included was a story I originally wrote for the Ligonier Echo about the library’s history that coincided with the 65th anniversary of the Ligonier Valley Library Association. And, of course, Shirley wrote the wonderful foreword for Ligonier Valley Vignettes. I really look forward to working with the library for many more years to come. 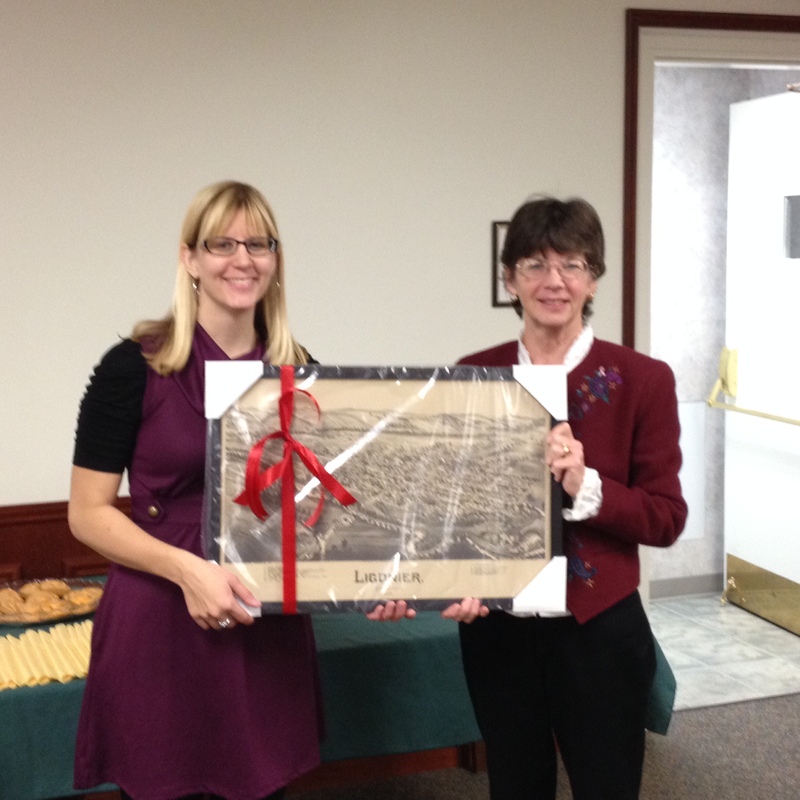 After my talk, Shirley presented me with a beautiful framed reprint of a map of Ligonier from 1900. I will treasure it always. I also want to thank everyone who came out on a chilly fall night to hear my talk – I really appreciate you coming out to support me and learn about some of the great history that happened in the Ligonier Valley. It really means a lot! 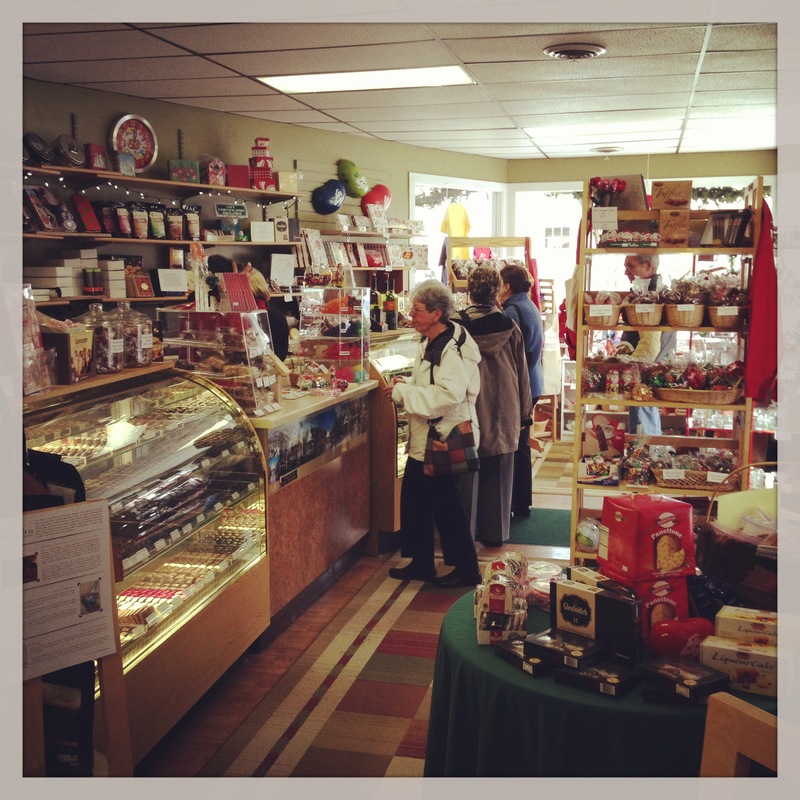 Also, this past weekend, the Ligonier Sweet Shop hosted me during a holiday book signing during Small Business Saturday. The town was really hopping that weekend, first with Light-Up Night on Friday, where Dave and I got to meet Santa Claus before he joined a short parade around the Diamond. Saturday was a busy shopping day and lots of people were out and about patronizing the shops and restaurants that are integral to the tourism that support the town. I have been very lucky not only to partner with a great small business in town owned by very kind people, Cokie and Richard Lindsay, but also to be able to build another connection to my book, as Cokie’s family owned Ligonier Beach, which I talk about in Ligonier Valley Vignettes. All in all, it was very nice to start the holiday season off with some fun holiday events in Ligonier. I don’t have any other author events scheduled until the spring, so I plan to take some time this winter to brainstorm ideas for the next book… Any suggestions? Previous postMy Veteran: Private First Class Thomas Alexander Piotrowski, Sr.